Governor Martin O’Malley announced on May 11, 2012 that the long planned Corridor Cities Transitway (CCT) would be Bus Rapid Transit (BRT). 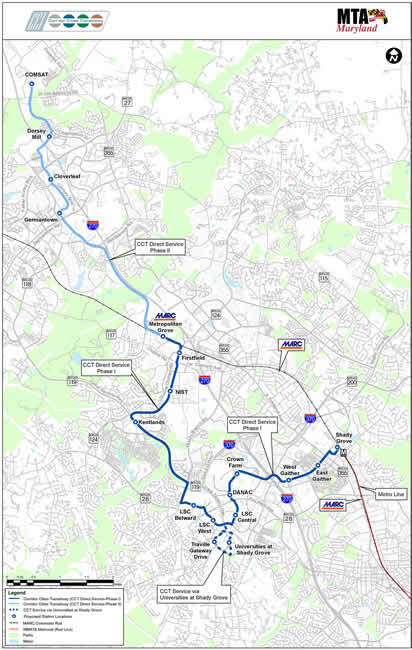 The BRT system would offer attractive and frequent high-capacity service between the Shady Grove Metrorail Station and the COMSAT site in Clarksburg, a distance of about 15 miles. When completed, the CCT would consist of 16 stations serving major activity centers such as King Farm (two stations), Crown Farm, DANAC, the Life Sciences area (three stations), Kentlands, NIST, First Field, Metropolitan Grove MARC, Germantown Town Center, Cloverleaf, and Dorsey Mill in addition to Shady Grove and COMSAT (see map below). Ridership forecasts for 2035 exceed 47,000 for a typical weekday. The project will be constructed in two phases, with the first phase being the segment from Shady Grove to Metropolitan Grove. The total estimated capital cost is $828 million, with $545 million of that total related to the Phase I construction. In addition, the CCT is a key component of the infrastructure of the City of Gaithersburg in support of existing and future development at Crown Farm and the Kentlands.